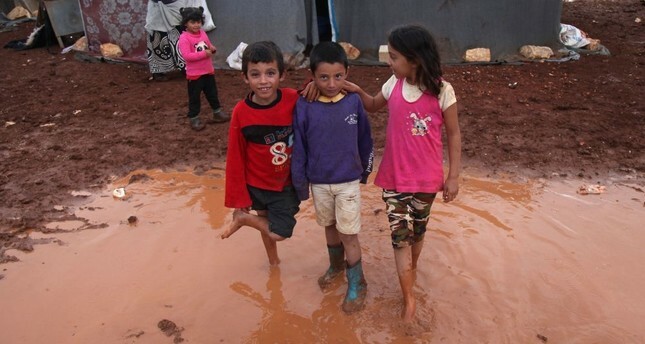 Internally displaced Syrian children pose for a photograph in a flooded refugee camp in the Idlib countryside, northwestern Syria, Oct. 25. The leaders of Turkey, Russia, Germany and France will meet to seek out new ways to reach a political solution to end the nearly eight-year civil war in Syria in a quartet summit in Istanbul on Saturday. President Recep Tayyip Erdoğan will host the meeting, where Russian President Vladimir Putin, German Chancellor Angela Merkel and French President Emmanuel Macron will also be in attendance. "Our main purpose at this summit will be focusing on new nonmilitary ways to establish a political solution in Syria," Presidential Spokesperson İbrahim Kalın, who was also involved in the preparation meetings for the summit, said on Friday at an international congress in the southeastern Diyarbakır province. "Our chief concrete expectation of this summit is that steps to be taken for a political solution are finalized and a road map is determined," Kalın also said. While Turkey and Russia have been active and influential actors in Syria, the inclusion of Germany and France, two of the heavyweights in the European Union, in Saturday's summit has been deemed significant as part of the EU's steps to ward off new refugee waves over its borders. The rise in the number of refugees flowing into the EU had caused panic within the bloc, leading to conflict among EU state leaders. Turkey and the EU signed an agreement on March 18, 2016 to stem the influx of refugees to Europe, which has been considered a significant example of cooperation between the two sides. Turkey has been the main route for refugees trying to cross into Europe since the beginning of the civil war in Syria. With the agreement, irregular arrivals decreased by around 99 percent, thus preventing the loss of many lives at sea. In addition, including France and Germany in the process is also seen as a move to balance the Russian and Iranian influence in Syria. On the other hand, the exclusion of Iran and the U.S., two other actors involved in the Syrian war, is also significant. Pundits have said Turkey and Russia are sidelining Tehran due to its sectarian aims in the region, while the U.S.' support of the PKK terrorist group's Syrian affiliate, the People's Protection Units (YPG), has ignited a severe conflict with Ankara. Kalın also said during the summit that efforts will be made to form a committee to write a constitution for Syria. Previously, Turkey, Russia and Iran launched talks on Syria in the Kazak capital of Astana to establish de-escalation zones, particularly around the last opposition stronghold, northwestern Idlib province, to minimize the clashes between the Bashar Assad regime and the moderate opposition and also to ensure the safety of civilians until a political solution could be reached. In addition, Erdoğan and Putin also reached a deal on a cease-fire on Sept. 17 to stop regime attacks on Idlib, which is home to some 3.5 million civilians. The deal set up a demilitarized zone of 15-20 kilometers. Moderate opposition groups have already evacuated the designated zones; yet, the withdrawal of radical groups is still continuing. The deal also foresees that opposition groups in Idlib remain in areas where they are already present, while Russia and Turkey will carry out joint patrols in the area. Since the Idlib deal was reached, the region has been relatively calm. Turkey had said that an all-out offensive on Idlib would cause a new refugee wave of nearly 3.5 million people from Idlib rushing to its borders and ultimately into the EU. Erdoğan has previously said he hopes the Istanbul summit will be a substantial step for Syria. On Friday, Erdoğan also hailed the Idlib deal, saying it was one of his government's successes in foreign policy. "There is now peace in the region," Erdoğan said in Ankara. "We have only one aim: To find a fair, sustainable, democratic political solution that will embrace everyone from any sect and background on the basis of Syria's territorial integrity to the crisis in the region," the Turkish president said. During the summit, United Nations Special Envoy to Syria Stefan de Mistura is also expected also deliver a speech on the achievement of the U.N.-brokered peace talks in Geneva. The Geneva talks have attempted to bring together the regime and representatives from opposition groups to form a new constitution for Syria. Yet, so far, no substantial results have been achieved. De Misture has also been included in the Astana talks, which the guarantor countries, Turkey, Russia, Iran, say is not an alternative process, but rather one that complements the Geneva talks. The U.N. World Food Program's (WFP) senior spokesperson also welcomed the summit on Friday, expressing hopes that "civilians will be the priority of the discussion." "The WFP hopes that civilians will be the priority of the discussion, re-emphasizing that rebuilding communities and solving the hunger crisis in Syria is hinged on ending the conflict that continuously fosters it," Anadolu Agency (AA) quoted the agency as saying. While Saturday's summit will seek to bring together the four leaders to meet to find a political solution to the Syrian crisis, their differences are also significant. For Turkey, finding a political solution to the Syrian crisis and establishing peace will also mean a possible homecoming for the nearly 4 million Syrian refugees it hosts. The presence and strengthening of the YPG, which has been benefiting from heavy U.S. military support and the political vacuum in the country, also constitutes a threat posed to its national security. While Turkey, Germany and France list the PKK as a terrorist group, the latter two EU countries do not see the YPG as an outlawed group. Germany and France, while they list the PKK as a terrorist group, have shown relative tolerance to the activities of the group's members within their borders. Both France and Russia have also expressed their support to Turkey following the Idlib deal and also said they are ready to contribute to the efforts for a solution in the country. Russia, the main backer of Assad, on the other hand, does not see the PKK or the YPG as a terrorist group, and the group also has an office in Moscow. Russia's support of Assad is another matter of disagreement between Ankara and Moscow. For Russia, ensuring that a political actor in Syria's future will secure its interests in the region is crucial as it also has military bases in the country, a region Moscow sees important for the influence over the Mediterranean. Meanwhile, the head of Syria's opposition's negotiation team said on Friday that peace can only be achieved in Syria if Assad resigns, German news service dpa reported. "It is impossible for this person who has destroyed Syria, who is responsible for the deaths of many Syrians, to remain," Naser al-Hariri was quoted as saying by dpa, from his remarks made ahead of a meeting with Russia's top diplomat. "Russia is capable of facilitating dialogue to achieve a political resolution," Hariri was quoted saying in comments carried by the Russian state news agency TASS, the dpa report added.